OREO range it’s our new and minimalist product range. 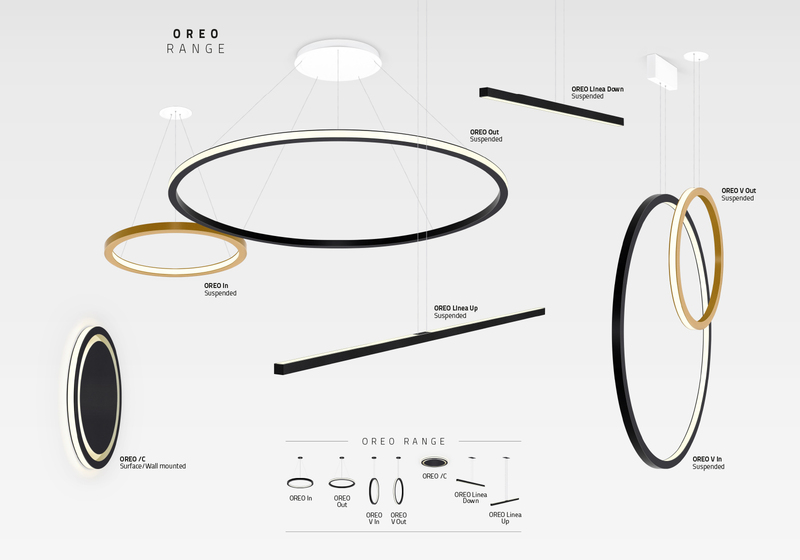 OREO range with his minimalist 35mm aluminium profile as well as the elegant and clearly defined contours allows new lighting concepts, contemporary visual effects and unique creative solutions for your space. Equipped with the latest LED technology, OREO range is available in suspended horizontal or vertical versions with inside or outside light distribution, linear versions with up or down light distribution and even a surface mounted version with outside or inside+outside light distribution. The whole range can be combined with 16 colors. OREO In - Suspended horizontal version with inside light distribution. OREO Out - Suspended horizontal version with outside light distribution. OREO V In - Suspended vertical version with inside light distribution. OREO V Out - Suspended vertical version with outside light distribution. 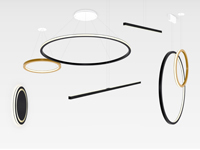 OREO Linea Down - Suspended linear version with direct light distribution. OREO Linea Up - Suspended horizontal version with indirect light distribution. OREO /C - Surface mounted version with outside or inside+outside light distribution.